Remember to tell them where you heard about the contest (mwctoys) and complete the handful of other fields. The contest ends tonight so don't delay - good luck! PS: please feel free to share this link as well, but don't alter it. This contest won't be shown on their own website, and is intended for affiliates to spread the word. By clicking my link and entering, you're also helping me out, as the affiliate with the most entries wins a PF too! Who doesn't want more Wonder Woman? 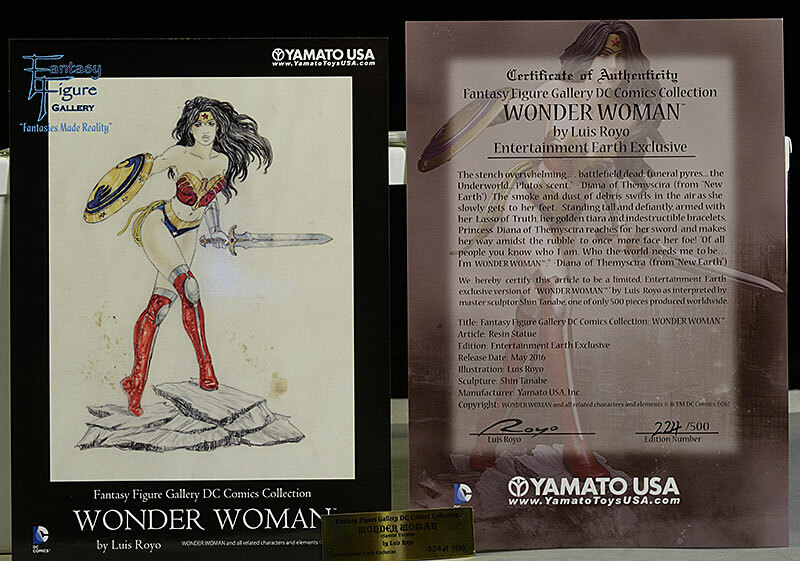 Now let's get to this terrific Yamato Wonder Woman statue, also offered through one of the site sponsors: Entertainment Earth. 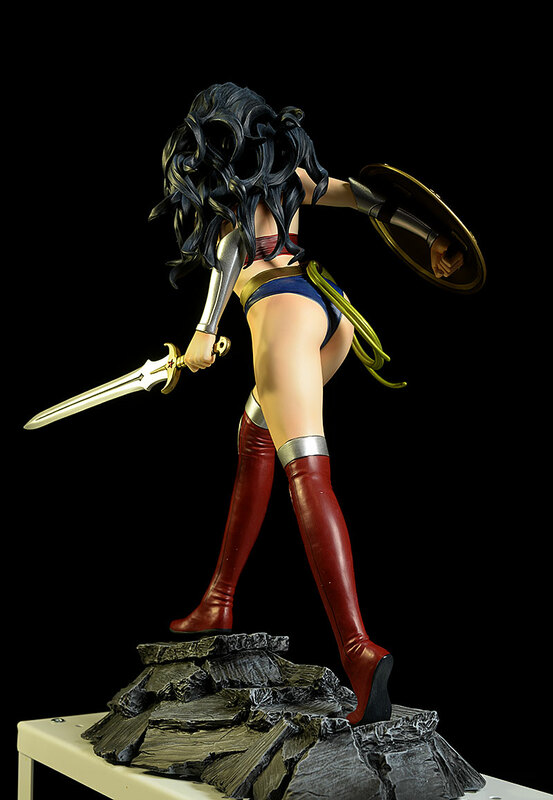 Obviously, the world is in love with Wonder Woman right now, and this large statue shows her off in comic style. The design is from famed artist Luis Royo, sculpted and painted by Shin Tanabe. There's actually two versions - a standard release and an exclusive variant which is limited to just 500 pieces. I'm checking out the variant tonight, but I'll discuss the differences in the Sculpting section. Pretty standard stuff on the outside, and Yamato gets a little crazy, as they always do, with the multilingual requirements. The statue comes in five main pieces - lower left and right arms, full body, rocky base, and sword - and assembly is fairly straight forward. There's no instructions, however. I love the type of foam they used for the interior padding. This is a very high quality foam, very thick, and more plastic based than standard Styrofoam. It doesn't fall apart, is easy to work with, and it keeps everything very safe and sound in transit. 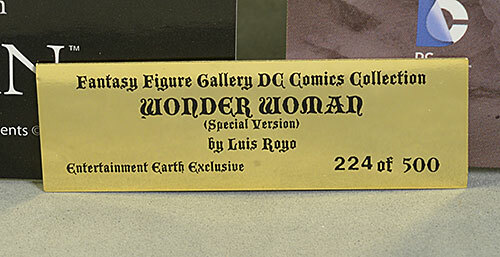 They get a big boost here thanks to the inclusion of a very nicely done Certificate of Authenticity, which includes the edition size and number of course. It's quite attractive, although a bit on the large side (8"x6"). It even includes an embossed seal, much like a notarized document! The sculpt on the variant version is slightly different than on the standard release. Check out the standard here for comparison. This is a beautiful and feminine yet strong comic version. The face is attractive and symmetrical, with long flowing hair and a stern, determined expression. The costume is slightly different on the variant, showing off a small bare midriff and different boots, and this version has her carrying her shield and sword, while her lasso is on her right hip. 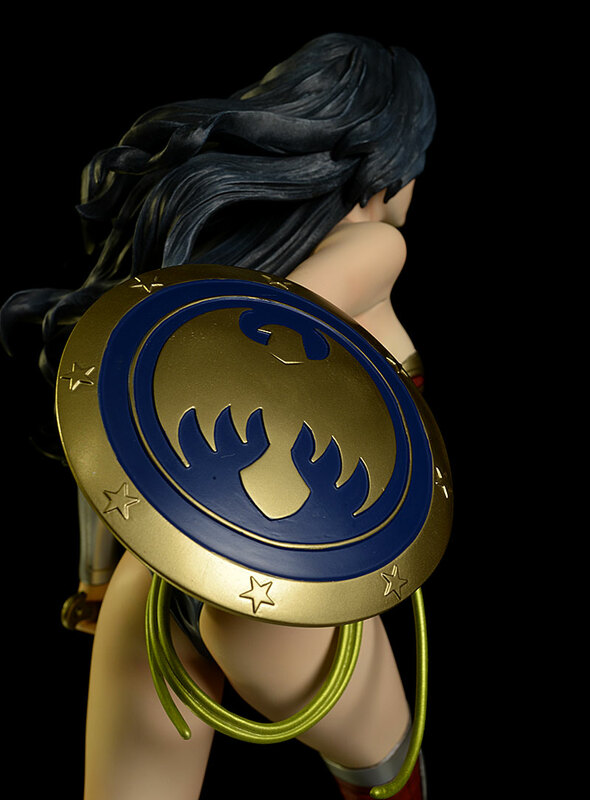 The standard version has the lasso in her right hand, with the sword embedded in the rocky base and the shield lying to one side. With this variant, the shield carrying lower right arm, sword carrying lower left arm, and lasso, are all held in place with magnets. There's no instructions, but it's a pretty straight forward assembly. Just make sure you pop off the pommel on the sword, insert it into the left hand, and then reattach. This is one of those rare cases where there's simply no doubt about it - the exclusive design is far superior to the standard. I'm not exactly sure what the thought process was behind having the sword and shield on the ground, rather than in her hands, but this variant corrects that design mistake. It also reminds me very much of the scene in the film when she crosses "no man's land". 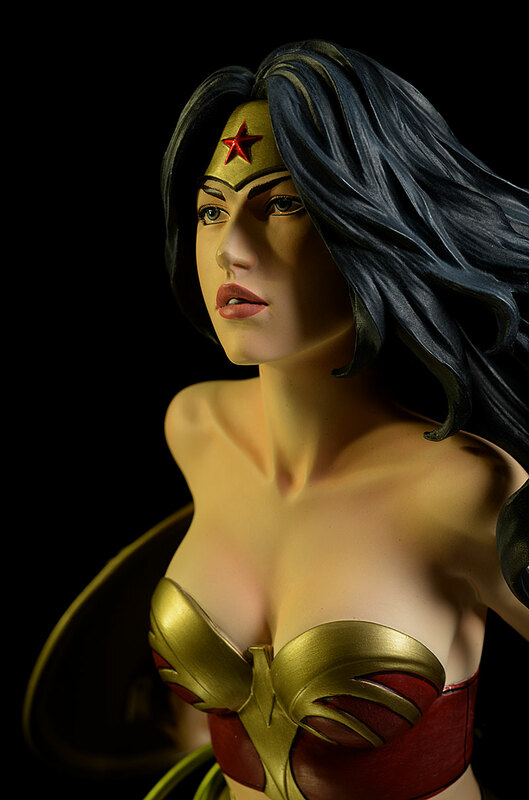 Sure, the costume is completely different, and as beautiful as this comic sculpt is, it can't come close to the amazing Gal Gadot, but the pose and attitude it exudes reminds me of the pivotal scene. I do have two issues that drop the score slightly here. First is the hair, always a bug-a-boo for statues. We've seen the sixth scale market get much, much better about creating finely detailed hair, but the statue market is yet to catch up. While I understand that this design is not intended to look 'real', but is rather a comic book interpretation, I still want more stranding and detail in my hair sculpts, particularly at this scale. My other issue is more with the design than the quality. If you place her right foot all the way into the base as intended, which puts the foot flat on the rock, she looks to me to be leaning too far forward. Look at the photo on the box, and I think you'll see what I mean. However, you don't *have* to shove the foot all the way flat to get a solid build. The foot has a metal post that is fairly long and runs down into the base, and the top half of this metal post also has a rocky rectangle around it, further filling the hole in the stones. I inserted this rocky post about two thirds of the way in, leaving the foot just slightly off the base. This tilted her back just a bit, creating less of a lean and giving the impression that she is about to step onto the rocks in front. I prefer this look, but of course, your mileage may vary. This is a pretty big statue, with the overall height (including the base) coming in at about 12 1/4". Even better than the sculpt, the paint quality here is outstanding. I think I might have an early nominee for the Eddie Wires award in the 2017 Poppies. The work on the face is excellent, with sharp, clean eyes, no bleed at all, and just a slight gloss to give that wet look. The eyebrows and lips have even edges, and the subtle eyeliner and lashes are just about perfect. Perhaps the best feature is the consistency of the overall quality. The areas covered by large swathes of paint, like the skin, are super consistent in their coverage and finish. Even the gold and red sections of the costume, both tough colors to keep consistent, show an even coverage and color. There's still a very minor slip here or there, but the overall quality is extremely high, and it creates a fantastic first impression, supporting and even improving on the underlying sculpt just the way it should. At $250, this is an expensive statue, no doubt about it. The body and arms are done in a plastic resin similar to what you'll see with Kotobukiya or other big name manufacturers, which makes it less likely to break or get damaged with handling. The base feels like more traditional resin, and is quite heavy. You're definitely getting some serious quality here, but the regular release runs around $200, and that price point seems right for what you're getting. The extra $50 is 'limited edition tax', and ends up dropping this figure by a half star off average in this category. Not a thing. Everything is sturdy and well made, and I didn't have any concerns about damage or breakage. Be sure to pay attention to how the pommel goes back into the sword hilt - if felt like there was only one correct way. But other than that, you should be good to go. This is a very high quality statue, from materials to construction to paint. Unless you get an oddball, you shouldn't have any issues with the statue from any quantitative perspective. Which leaves it all up to the qualitative aspects, the aesthetic appeal of the design and the overall comic book mojo. I have to admit that the 'proper' lean is a bit too much for me, and only by adjusting the foot slightly upward in the base did I get a look I was really happy with. That minor tweak created a much more appealing overall impression, and I'm extremely happy with how she looks on the shelf. 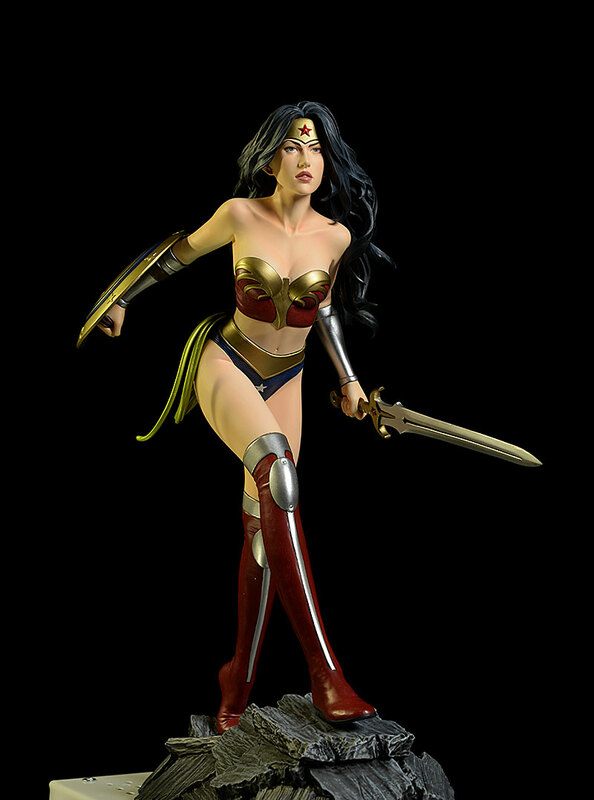 - Entertainment Earth is the place to pick this one up, where she is $250 with free shipping. 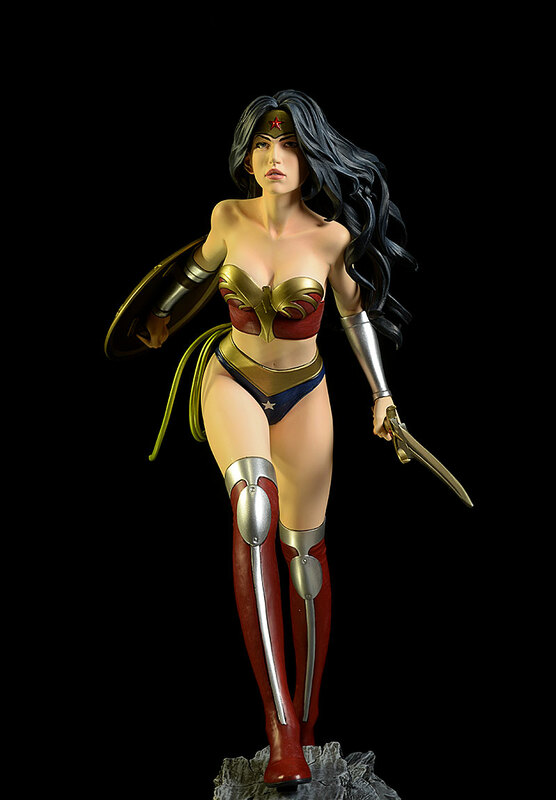 Other Wonder Woman goodies include the Multiverse figures based on the new film, including Wonder Woman, Queen Hippolyta, and Ares, as well as cloaked Wonder Woman and Steve Trevor. 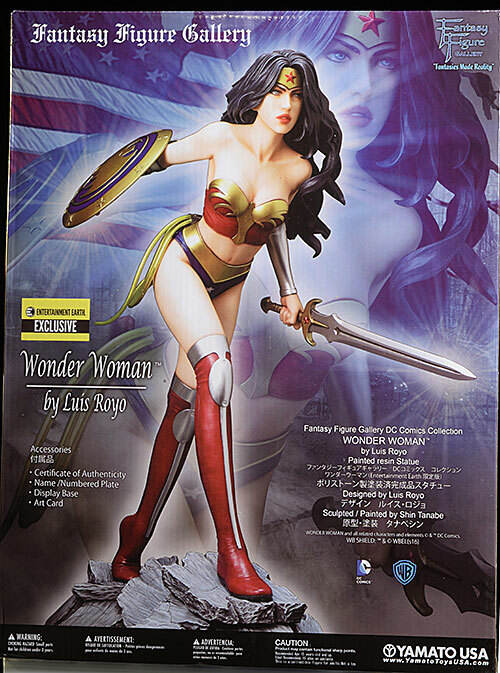 Mattel also did a Multiverse (and regular) figure of Wonder Woman from BvS. 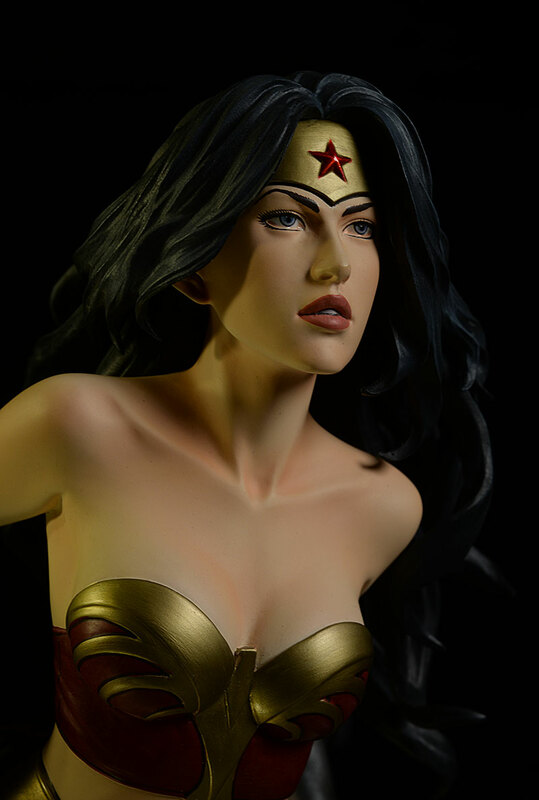 If you're a fan of the character in general, you should check out the ArtFX version, as well as the DC Bombshells version, the first Cover Girls release, the second Cover Girls version, the Bishoujo release, and the Armored Cover Girls version.